Want to learn python programming? 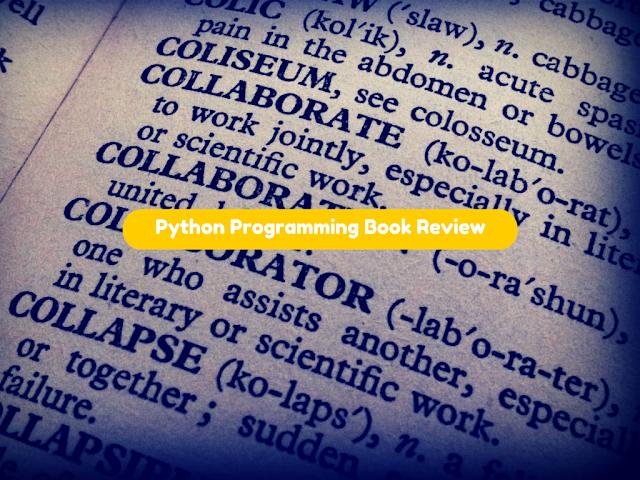 This is a an exclusive book review for one of the best Python programming books available for beginners. It has been recommended by hundreds of people online and referred by many python beginners as well as advanced programmers. Python is undoubtably favorite language of web developers. Learning python from a book is absolutely the best way to learn programming. This book is a good fit for beginners and college students who have little or no exposure to programming. This article tries to bring our opinion about the book with pros and cons. This book is the second edition of Python Programming written by John Zelle. This edition is made with the updates for Python 3. The aim of creating this book is to use it as the main text in colleges by the students of first level course of computer science. The book is all about computer science, essentially Python – a non-traditional language, and gives more emphasis on designing, programming and problem solving. The author John Zelle is a professor of Computer Science in Wartburg College of Iowa. He holds Ph.D. in Computer Science from University of Texas and has published many research papers and books on Computer Science, mainly on programming languages. As mentioned earlier, this book is written keeping the first level course students of Computer Science in mind. It is a great resource to gain knowledge about Python Programming and is recommended for them who want to learn this non-traditional language, especially the beginners. Many students have interest in learning ethical hacking – this book is good resource for them as well. It helps the reader understand Python from the basics and the illustrations, examples and solved problems make it easier still. It is a good read for the professional software engineers as well who are working on writing programing languages for famous organizations. The first aspect worth mentioning about the book is its clear and easy to understand language, which is supported by lots of examples, activities and illustrations that make it even easier to understand the concept of Python language. The book is a must have for those who are new to programming as it introduces a novice to the foundational concepts of computer science so well. The author has written the book in such a way that the reader enjoys reading the book and he has done a great job in explaining the concepts. The explanation of syntax is very simple, detailed, object oriented and very high level. One of the USPs of this book is that it has explained each concept in detail without missing anything. The book is sheer combination of ease of use, value and academic excellence. The author is successful in keeping the reader of the book engaged with the book, which is a very important thing to stress when one is writing a book, especially when it deals with languages and programming. This book is one of the best books that build foundation for the students to advance to the next course on programming and language. The author has written this book with nice and slow pace and the best part is he has given importance to every aspects of the book without taking anything for granted. The concepts and the details in the book are connected to each other very well, which makes it easier to understand. The recommendation of this book had come from many readers and special mention was given for those who are new to Python programming as it gives a great intro to every concept of Python programming. The book does not only teach Python, but it has the capacity to teach programming in general by giving illustrative examples and concepts. The way author laid out the concepts of programming in general can be applied to a variety of other programming languages. A problem with the approach of this book is that the author has taken a strange path to teach programming. One of them is introducing objects and graphics prior to explaining conditional loops. From few of the concepts, it is evident that the author has a lack of understanding about the eval() function, which is used in input. Also, being an introductory book to computer science, it was too early to include chaos functions in the first chapter itself, which is confusing. The author could have done a better job in organizing the content of the book in a more structured manner. For example, the definition of important concepts is mixed with the rest of the text. The second edition of Python Programming is an essential book for everyone who wants to learn programming and is one of the best books as far as introduction to computer science is concerned. Author John Zeller has done commendable job in most of the parts of the book making it a must have. However, a more structured approach to organize the content and rectifying the confusing 'chaos' function in the first chapter could have made the book even better.